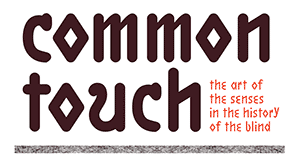 Over one month has passed since the opening of Common Touch on April 4, 2016. Since that day a few hundred visitors have experienced the multi-sensory exhibition and complementary programming. Jayne’s installations have transformed the Library’s gallery into a tactile world where looking is an embodied act. Abstract forms, geometric shapes, and first person constructions infused into works in hues of blues, green, yellows, and maroons entice visitors to engage with pieces inspired and representing teaching tools used in the historical education of the blind. In tandem with Common Touch’s opening, there has been a flurry of tours, programs, and receptions over the last few weeks. The packed opening reception on April 5 was soon followed by a visit from students from Haverford College’s Hurford Center Dialogues on Art program. On April 18, Common Touch partner Art-Reach held their Philadelphia Cultural Accessibility Peer Group (PCAP) meeting at the Library. The panel discussion featured artists and art advocates, including Jaynes, and the work being done to create more accessible programs in cultural institutions. On April 20, Terry Galloway gave a stirring and intimate performance of her one-woman show You Are My Sunshine at the Gershman Y about her experiences with a cochlear implant. And on April 26, project partner Philly Touch Tours hosted a tour of the exhibition for attendees of the Accessible World Conference (April 27-28). We could not have asked for a more auspicious start to the run of Common Touch. Jaynes’s work are named in homage of the education materials – Gifts – designed by Frederich Froebel (1782-1852), the founder of Kindergarten. Who is Dorrie Rush Common Touch Catalog Coming Soon!